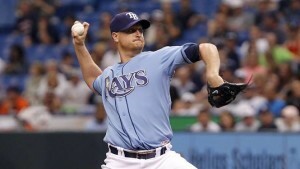 The Tampa Bay Rays activated Alex Cobb off the 60 day DL and designated infielder Ryan Roberts for assignment to clear space on the roster. Cobb has been on the DL since being hit by a line drive off the bat of Kansas City’s Eric Hosmer in July. Cobb, 25, is 6-2 with a 3.01 ERA, 1.16 WHIP and 76 strikeouts in 83 2/3 innings this season. He made two minor-league rehab starts, most recently going 4 1/3 innings (giving up five hits and three earned runs) for the High-A Charlotte Stone Crabs. Roberts was acquired last season from the Arizona Diamondbacks, but he hit just .229 with 11 homers and a .658 OPS in 120 games for the Rays while seeing time at second base and third base.